If you’ve ever looked for advice on how to boost your physical performance, increase your endurance, or recover faster, you’ve probably realized most athletes believe that loading up on carbs is the best way to get the job done. That’s why sugary energy drinks and sports gels exist. The sugar is supposed to give you a burst of energy that either keeps you going during an intense workout or helps you recover when you’re done. At first, this might seem reasonable — sugar turns to glucose, which gives you immediate energy or gets stored as glycogen that your muscles use for recovery. There’s just one problem: This glucose-burning cycle creates a lot of internal inflammation, which harms your metabolism, delays recovery (ironically), gets in the way of your performance goals, and triggers gastrointestinal issues. Sure, you may be able to look fit by chugging down sugar-laden protein shakes and energy bars after workouts, but you’re causing internal cell damage that hurts you in the long-run. Today’s guest, Steph Lowe, experienced this cycle (and the problems that come with it) first-hand as a triathlete, so she decided to do something about it. She knew she wanted to help other athletes find a cleaner and healthier strategy for enhancing their performance, so she became a sports nutritionist and founded The Natural Nutritionist, where she helps others athletes optimize both their health and performance through a low carb, high fat ketogenic diet. 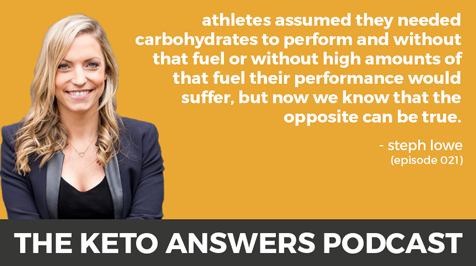 She’s one of the top nutritionists setting the record straight on how ketosis influences performance, and today she tells us exactly how athletes can get better results from their workouts and optimize their overall health by switching to ketosis and ditching sugary fuels. Listen in if you want to perform at your best — whether you’re a seasoned athlete or a casual gym-goer. The effect of inflammation on performance, gut health, cognition, and mental health.